EaglEyeMed - Enabling Real-Time Remote Diagnostic Imaging. Enabling remote, real-time medical exams over existing network infrastructure using a wide variety of currently installed medical equipment. Formed in 2012 to create software that enables real-time remote medical examinations using existing Ultrasound, Xray and other Diagnostic Equipment. are standing right in the exam room. guide the sonographer efficiently through the exam. give input to make adjustments for better images. in acquiring good images of potential lesions. EaglEyeMed is breaking new ground with EagleX – a Networking and Data Compression Technology which enables REMOTE REAL-TIME MEDICAL EXAMS for both Human and Veterinary medicine. EagleX is FDA-approved, HIPAA compliant and available immediately. The Eagle X software runs on low cost laptop or tablet devices and seamlessly integrates with existing medical equipment. 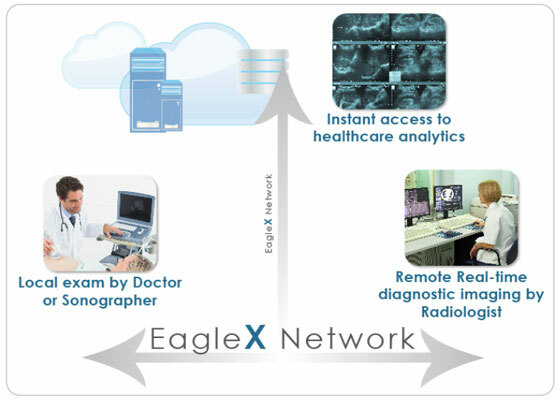 Eagle X delivers remote, real-time diagnostic quality images over existing network infrastructure. © 2019 EaglEyeMed. All Rights Reserved.